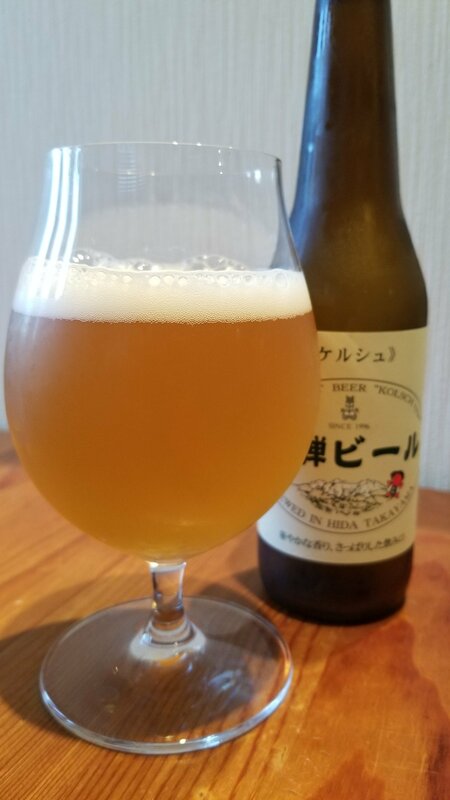 Hida Kolsch is 5% kolsch beer from Hida Ji-Beer, based in Hidatakayama, in Gifu, Japan. It’s part of their all-year round range of beers and can be found in bottles only – we’ve yet to see it outside of the area on draft. It’s brewed using imported German Hallertau and Czech Saaz hops and is brewed to a traditional Koln recipe. Hida Kolsch poured out a hazy amber yellow colour with a plump white head on top that clung to the side of the glass throughout drinking. There was a distinct noble hop-like aroma to it with some fruity edge to it and a crisp biscuit base coming through. Eventually. To say the malts were dull would be an understatement. The fruity edge was the most potent but it wasn’t as strong as some kolsches we’ve had on BeerTengoku. The fruity edge extended into the body, with it being the main flavour in the beer. Hida Kolsch had a subtle buttery, sour edge to it that lingered on the palate for a bit too long really – maybe off-flavours from the fermentation or it had been stored badly? It wasn’t enough to stop me from drinking it, but it’s in there, so be warned. The malts produced a crisp bite to the beer but by that time it was too late. Maybe it was stored badly or fermentation went wrong but the butter and sour edge to it puts me off from recommending Hida Kolsch.